Sparkling Awards Ceremony for RML Chevrolet. The RML Chevrolet team rounded off the 2007 season by cleaning-up at the glittering World Touring Car Championship (WTCC) awards in Macau on Sunday evening (November 18th). As the dust settled on the final race of the season around the torturous street circuit, the RML Chevrolet drivers, team bosses and crew celebrated the team’s amazinglysuccessful season in style at the sparkling ceremony held at the Fisherman’s Wharf. The team collected trophies for Alain Menu’s victory in race one in Macau (right), as well as one for being race one winning manufacturer, which was presented to Ray Mallock, RML Group Chief Executive. Trophies were also given for Rob Huff’s third place in race one and Nicola Larini’s second place in race two. Eric Neve, Motorsport Manager of Chevrolet Europe was presented with a special trophy to mark the team’s finish as third-placed manufacturer in the WTCC. With a total of five trophies on the evening, RML took two more than BMW and SEAT, and three more than Alfa Romeo. 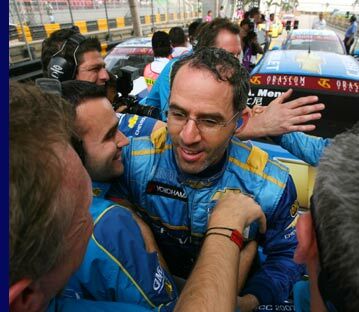 The RML Chevrolet team enjoyed a hugely successful 2007 season, with Alain Menu becoming the driver with the most wins (five) and pole positions (five) over the course of any WTCC season. Indeed, despite not winning the title, Alain picked up more top-level statistics than any other single driver, including Andy Priaulx (WTRCC Champion) by failing to clinch just one of the many accolades; that of the greatest number of "fastest laps". RML Chevrolet took seven wins from 22 starts, representing a win rate of 32%, also leading more laps than any other team. Alain was also topped the charts for the most laps led over the season with 64, 16 more that Augusto Farfus. Ray Mallock said: “We have enjoyed another fantastic season with Chevrolet, with most successful since the start of our partnership in 2005. These trophies are an important reflection of our success, as they represent the hard work, dedication and unwavering spirit throughout the RML Chevrolet team. “We have recently renewed our partnership with Chevrolet for a further three years, and I am confident that our teamwork, continuous improvement, attention to detail, reliability and winning focus will lead us to our next goal of being World Touring Car Champions. Throughout the 2007 WTCC season, Chevrolet Insight has been giving a behind-the-scenes look at the Chevrolet WTCC racing team. On Saturday and Sunday, media and fans alike could obtain the latest information and ask their questions via the web in Chevrolet's own web cast. There were regular airings during every race weekend, and then a full 15-minute review programme which can be viewed at any time. Visit www.chevrolet-insight.com.